“Over the Tavern”, Tom Dudzick’s beguiling family comedy, is just what the doctor ordered. Set in Buffalo, the playwright’s hometown, its story carries us back to that most idealized period of 20th Century America, the Eisenhower years of the 1950s, and introduces us to the Pazinskis: Mom, Dad and their four children, Eddie, Annie, Georgie and the hero of our tale, 12-year-old Rudy, a precocious kid who’s starting to question family values and the Roman Catholic Church. (He believes God put us on earth to “have fun,” and he’s trying to figure out why his family isn’t having any. At first, as Rudy matches wits at school over his catechism lessons with the awesome Sister Clarissa, this looks like another variation on the endless nun comedies of the last few decades. Well, it is and it isn’t. True, Sister Clarissa carries a clicker and a sturdy wooden ruler for discipline, but she’s more than a caricature and an object of nostalgia. Like everyone else in this play, she may be idealized, but, she’s also achingly human in her flaws and feelings. Once Rudy comes home to the crowded family apartment over his father’s tavern, it becomes clear, too, that he is not living in a “Father Knows Best” environment. His dad is a physically and psychologically wounded man who leaves work “in a bad mood,” yelling at his kids and long-suffering wife. His sister Annie is suffering through the confusion of sexual awakenings, his older brother Eddie is a rebellious teen trying to start his own life, and Rudy himself, an imaginative youngster with a quick wit, has the responsibility of looking after the mentally challenged Georgie. Both the cliches and the truths of Dudzick’s script about the joys and travails of this family blend into a heartwarming drama filled with telling details. When Mom and Dad fall into each other’s arms in a sprightly late-night polka in their living room, it’s a little bit of heaven. Three years ago Studio Arena Theatre optioned Dudzick’s play and, the truth is, had no idea what it was getting into. The critical reception was warm yet guarded. Dudzick himself was not entirely satisfied with some of the writing. The next thing the Studio knew, though, audiences were clamoring for tickets. Performances sold out. The run was extended. Clamor for tickets continued even after the play had to close. The Studio and Dudzick agreed to do it again the next season. They did. Same thing. It sold out. It’s now back for a third year. ‘Tis the season for family offerings such as “The Nutcracker” and “A Christmas Carol,” but “Over the Tavern” is considerable more fun than either. After a sold-out run at its home, this Northlight Theatre production has been moved to the Mercury Theatre at least through the holidays. A word of advice: get your tickets to Albany’s Capital Repertory Company production of “Over the Tavern” in a hurry. Once word of mouth about this family comedy gets out, good tickets will be hard to come by. Having a good time in the theatre, spending quality time with people we care about and enjoying the experience, has almost become a thing of the past. One of the great joys of “Over the Tavern” is that you will be nodding your head in recognition as you are wiping tears of laughter out of your eyes. As funny as the play is, what really makes it work is the humanity of the characters playwright Tom Dudzick creates. These are not great people with great problems. These are real people with real problems. Actually, there is no “era” for this play. The situation and problems that the play addresses still exist, and recognizing them through these characters is what makes “Over the Tavern” so special. 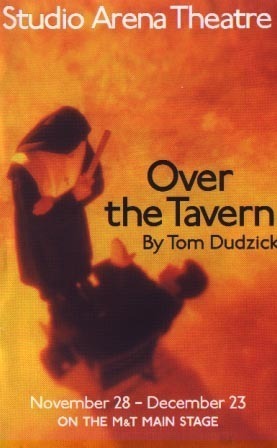 Dudzick is a skilled dramatist, and “Over the Tavern” has a sneaky way of winning an audience. The Catholic humor is the surface lure. This play is really about family life, and it warmly engages the audience because it portrays that life with accuracy, affection and a resistance to overdoing sentimentality. The piece simply proves that good writing and outstanding, perfectly timed performances work in the theatre. “Over the Tavern” with a heart as big as its belly laughs, is the nearest Catholic equivalent to date of Neil Simon’s tenderly Jewish-American “Lost in Yonkers” and his Brighton Beach trilogy. Dudzick’s is a voice that tells us who we were, which is, after all, the first measure of who we have become.